1. Factor, state domain, and THEN reduce. crosses (multiplicity is odd) x-axis. 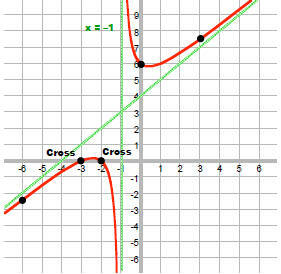 x = –2 has multiplicity odd so graph crosses here. 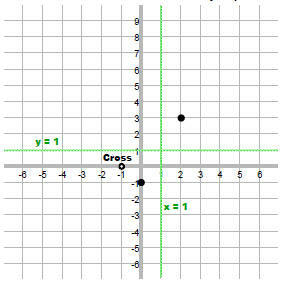 x = –3 has multiplicity odd so graph crosses here. 3. Draw vertical asymptotes (the zeros of the denominator). 5. Plot where the graph crosses a horizontal or oblique asymptote, if it does. Find where R crosses horizontal or oblique asymptotes. NOT cross the oblique asymptote. 6. If needed, plot a few extra points. Since the (x + 1) factors cancel, there will be a hole at x = –1. 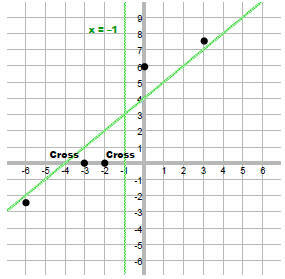 x = –1 has multiplicity odd so graph crosses here. 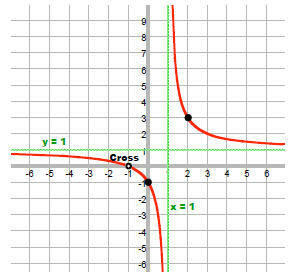 But, x = –1 is not in the domain so R does not cross the horizontal asymptote. This has no solution so R does not cross the horizontal asymptote. looking at the multiplicity of the vertical asymptote. would have had to go up or down together.